“Sunshine” Sid was a star football quarterback and basketball guard at Decatur High School before graduating in 1916. He went on to Millikin University where he also played football and captained the basketball team. On Sunday, November 9, 1919, while still on the Millikin varsity football team, he and J.M.U. teammate Roy Adkins took money to play for the Staley semi-pro football team against Taylorville. Within the week, the two collegians were forever banned from participating in Millikin athletics for their “yellow trick”. Both men dropped out of school. 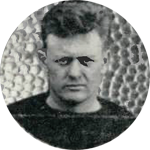 In September 1920, Gepford and five other former Millikin athletes joined the Staley professional football team. The agile but small red-head subbed at halfback in the first two home games in October and never played pro ball again. For his efforts he was paid a $30 bonus at the end of that season. In September 1922 he enrolled at Bethany College in West Virginia and was suddenly on a team of many past American Professional Football Association and future National Football League players, including four from the old Staley’s team. Gepford played football and basketball and graduated in June 1924. However, it was in a fall 1923 football game against Butler University that Gepford suffered a severe concussion but kept playing. He suffered terrible headaches all summer in 1924 while working back at the Staley starch plant in Decatur. In late August he moved to Marion in Southern Illinois where he was to coach and teach some history. After two weeks of football practice classes were to begin and he said that his history duties “scared me to death.” On September 9, he committed suicide and left five notes of explanation. At the funeral his mother blamed his irrational behavior on head problems caused by football. Today this would be called chronic traumatic encephalopathy, C.T.E. Gepford is considered the second former NFL player to die and perhaps the first to die of football related brain damage. He was buried in the Harristown Cemetery just west of Decatur on September 12, 1924.